Scorpio 2018 Horoscope indicates that you might just miss the sting and energy that you possessed in the past years. Religion and spirituality appear to be taking the center stage for you this year with major involvements in community. Financial well being looks a bit under the clouds but a political inclination also appears on the horizon. Real estate investment or renovation business holds great potential if you are looking for wealthy cash flow. You may have to manage your relations better with family members especially your father. October 2018 promises to be the month that sees you ushering in a period of renewed energy levels and growth. The 2018 forecast for Scorpio indicates a relatively moderate period for expansion and opportunities. There might be marginal success on financial front however these should not affect your overall growth. You may have to keep a lid on high expenses as this might affect your savings. Purchase of fixed assets could exert undue pressure on savings. Overseas sources may offer significant opportunities but travel may shift your attention from family matters. It is advised that before making a move in favour of such opportunities, you should ensure the scope of growth related to these. However you should make careful analysis as the actual implementations of these plans have their own share of pros & cons. Avoid making any expensive spending as current income level may not be in a position to sustain such efforts. With no clear picture over your funds, investing in new ventures should take a back seat for now. You should see yourself battling out of tough situations during May-September 2018. Your aggression and dynamic behavior makes you quite a growth oriented individual during this period. July & August 2018 are months that might have the possibility of minor conflicts with your co-workers or others at work. The same could be said about September-November 2018 where chances of taking wrong and aggressive decisions between you and your partners could be there. The possibility of this appears highest in October & mid-November of 2018. Going by the Scorpio 2018 predictions, personal matters pertaining to romance and matrimony need some attention. February to May 2018 and 8th October to 17th November 2018 are periods that point towards an exciting phase in your love life. New relationships and physical attractions appear on the horizon. You might have to be a little careful in conducting yourself between April & August 2018. The matters relating to marriage may become a reason of disharmony at home as members of the family might share varying views & opinions. Finance appears to be dragging and not smooth as indicated in the Scorpio Horoscope 2018. You might have to make some extra efforts to get things smoothly back on track. A calculative and planned approach towards expenses and investment should work for you. It is advised that you spend wisely instead of getting tempted on personal things; this would be really beneficial after October 2018. The message for this year is clear and out: spend wisely, focus on important targets and plan well before taking decisions. You might have to watch your back as someone may try to sneak into your personal things. Stay cautious of phishing & similar activities however the time after October 2018 appears positive. January 2018 Horoscope denotes a strong and courageous standpoint for you. The celestial forces may support you during this period. Amassing of assets is probably going to rise. Kin may see distinction and rise in fame in this month. You may encounter a religious pull and set out on a profound excursion. Monetarily, the month should generally bring soundness. With enhanced eagerness, you may grow great basic leadership abilities. This may bring acknowledgment for you at work. You may even make materialistic accomplishments during this period. Career looks promising and finances are likely to become stable. By and large, the month should bring flourishing for you and your family. 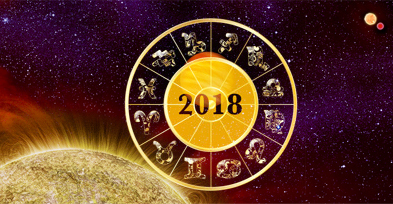 February 2018 Horoscope indicates a time of quality ahead. You may see a rise in reputation and status at work. The divine developments are in support for your and your family's flourishing. Your kin may become famous in this period. Slant towards the soul world may take you on short outings to journeys. Your energy and mind from the earlier days go with you throughout this period and guarantee a change in work status. With virtues of leadership, you may end up as the winner and as the new pioneer in the work region. You should do well to maintain a strategic distance from conflicts among associates. Occupation or business is probably going to witness success during this month. March Horoscope 2018 represents control. Your work and initiative abilities are likely to be noticed and take you to a definitive position. Regard and popularity ought to take after also. Monetarily, the period may for the most part, stay splendid with a steady income and charming financial benefits. New associations and expansion of network might be the features of this period. Childbirth related issues might see hindrance and may require precautionary measures. Openings from the govt. may suite students who are as of now seeking higher opportunities. Generally, the month gives off an impression of being positive for the most part on all fronts. April 2018 Horoscope denotes a sparkling professional period ahead. Benefits and ascend in reputation should run as an inseparable unit with your profession. Going up against new tasks and projects may create the coveted increases. Vocation development is generally accompanied by envy among associates and rise in rivalry. In this way, you ought to stay cautious and maintain a strategic distance from any contentions at work. Wellbeing may cut you down briefly in this period and you should play it safe for your health. Wellbeing may require some expenses to be made. May Horoscope 2018 has all the signs of being a focused period. Your profession development may wind up noticeably as a motivation for others at work, prompting a neck-and-neck race for advancements. Envy among coworkers may bring about inner conflicts. In any case, it should be advantageous for you to avoid any quarrels. You should implement a more casual way of life rather than always pushing your body beyond limits. Connection with your spouse may see sharp bends as your soul mate may build up a vain attitude briefly. In any case, you ought to be quiet and patient. Your life partner may soon turn into a wellspring of profits for you. Business accomplices are likely draw in benefits for business with their assets. Development at work may see light of the day. Voyages may bring feelings of serenity. June Horoscope 2018 brings along the indications of growth. Surprising development for your life partner is likely. Business may see a variety of new open doors for advancements and benefits. Business accomplices may pull in budgetary benefits. However, income may encounter a blockage. Thus, money related administration should be applied in this month and watchful checking of funds is advised. Mostly, this period should bring new prospects of development at all levels. July 2018 Horoscope implies the start of your fortunate period. With fortunes close by, you may expect a stream of accounts during this period regardless of a handful of minor hindrances. You are likely to build up a spiritual demeanor, which may even lead you on religious adventures or opting to think about new profound learnings. The cosmic changes favor you with administration and an imaginative personality throughout this month. Amid this period, you may hope to get the anticipated benefits. August 2018 horoscope seems to spread blended flavors throughout your life. Religious pull may prevail and develop further. An unharmonious residential front may concern you while, in the meantime, your growing social picture may help your confidence. A blessed period may exist with a positive stream of benefits. Career may see sudden boost, and a change in job is not advised during this period. Property inheritance might be subjected to disputes. September Horoscope 2018 brings indications of progression. The accomplishments from earlier months are likely to continue. The month should bring along a dependability for all areas of life. Work zone may see progress and development. You may expect to be credited at work for your efforts. Household front may confront storms and should be taken care of with politeness and deftness. October 2018 Horoscope brings balance for you. The period is probably going to level the pace of things. Income may slow down however, without hampering the monetary soundness. Cards indicate signs of monetary misfortunes for you during this period. Subsequently, you should stay alert in fiscal matters. Giving for philanthropy might bring serenity and cause vast changes that may enhance your own fortunes. Keeping your companions and friends close should keep up your spirits. Despite the fact that, it is encouraged to characterize and keep up limits in each connection as overindulgence regularly exhibits complications. November 2018 Horoscope is probably going to bring the best out of you. You may need to apply your gathered information to keep up your accounts and to keep costs under control. You should also maintain a healthy lifestyle and may work to enhance your fitness level. Following this advice may enable you to maintain distance from ailments or medical problems. You should also deal with your reserve funds precisely in this period. In general, November may see a sluggish pace of life. December 2018 Horoscope denotes a time of recoveries. Everything lost in the past segments of the year are probably going to be recuperated. With tolerance and patience, you may recover your wellbeing and riches at a steady pace. The appeal & magnetism in your identity may likewise return and bring along a brighter future. You may spend extravagantly during this month. A steady health may allow you to focus better on earning more profits. The period should bring a positive conclusion to the year for you.